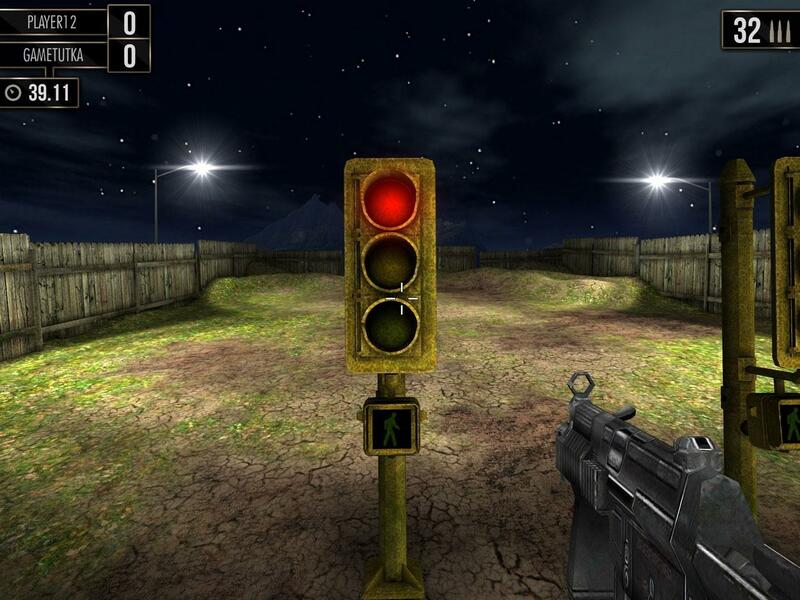 Show off your shooting skills in this exciting shooting range simulator game, Shooting Showdown 2! Pick a weapon of your choice and head over to the shooting range. Practice on a variety of shooting ranges situated both indoors and outdoors, and brush up your aiming and shooting skills. Think you’re good enough? Test your skills against a fellow human player and see who the victor is! Ready to get started? Well, Shooting Showdown 2 has really simple controls that you can use to move your aiming reticle around the shooting range. There are generally 2 forms of controls that you can choose from - you can choose to use a bluetooth gamepad to play the game on your GearVR or you could simply use the device’s in-built touchpad, coupled with look aiming (a.k.a. head tracking), to play the game. Feel free to try both controls out, if you have a bluetooth gamepad, by switching the aiming mode via the settings. Once you’ve gotten down the basics, I’ll bet you’re ready to start shooting some targets. However, hold on your overeager horses as you have not chosen a gun yet! There are 6 different types of guns available in Shooting Showdown 2. Starting off with a T2 pistol, you’ll eventually be able to earn enough gold bars to purchase guns with better ammo capacity, such as the .36 combat pistol, and the G33 Jackal. You’ll also be able to buy assault rifles, including the MP6 and the Juggernaut, which have better accuracy, reload speed, and recoil, later on. You can even upgrade your weapons using the gold bars you’ve earned in the 3 stats, namely accuracy, recoil, and reload speed, of a gun. Upgrades will be important especially considering that you may need quite some time to gather up the required gold bars to buy some of the better guns. Now that you’re equipped, it’s time head over to the shooting range! Shooting Showdown 2 provides a huge range of shooting courses – both indoor and outdoor ones – that you can enjoy. 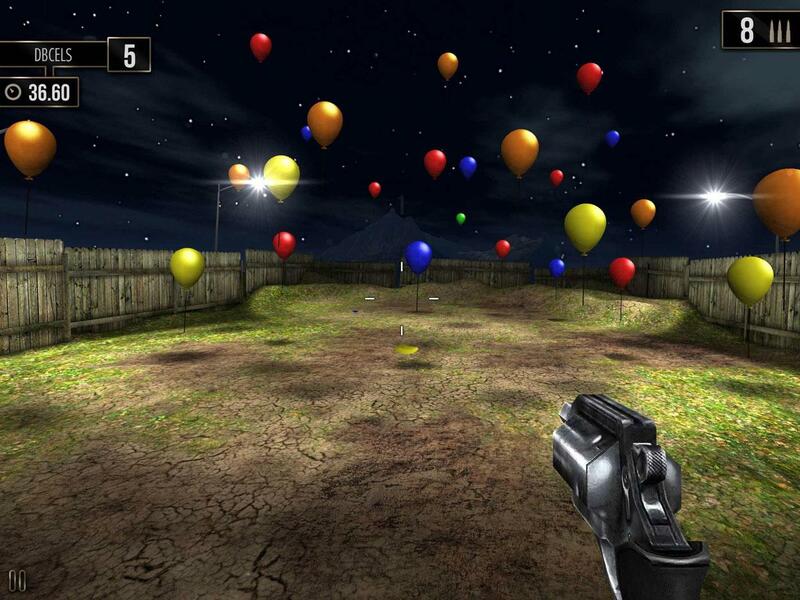 The game offers the usual “target practice” courses, whereby you get to shoot at a variety of objects ranging from ceramic plates and balloons to silhouettes and light bulbs. However, the game has some really unique and interesting shooting ranges as well. One of them involves you shooting at 5 differently sized die. Each time you shot a dice, it will roll around according to the game’s believable in-game physics, making it sometimes hard to get good shots repeatedly. Of course, to earn a good high score in this shooting course, you’ll need to target the highest score you can get on the die. In addition to shooting at die, you can also play some sort of a “whack a mole” game whereby the “whacking” part is replaced with some pretty frantic shooting. There is even an indoor shooting range in which you can shoot at falling voxel cubes of varying colors and patterns to score points. If you enjoy racing and shooting, you might like the “Race” course. In this shooting course, you’ll need to shoot your race car in order to make it move along the race track. Consecutive hits on the car will speed up your car while misses will show it down. This is, admittedly, a pretty fun shooting course. 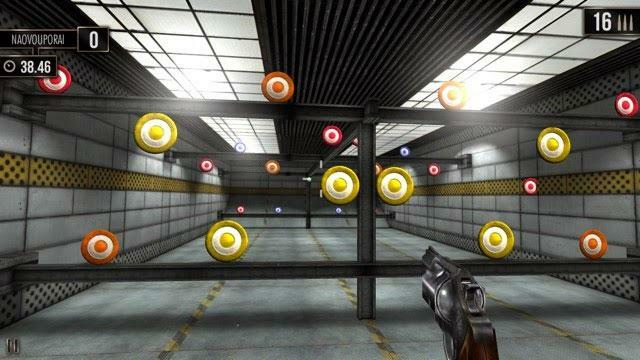 In fact, most of the types of shooting ranges available in Shooting Showdown 2 are very fun to play! For each shooting range that you come across, there will be 2 game modes for you to choose from, either Practice or Compete. It’s best to give practice a go first, because it might take awhile for you to get accustomed to its gameplay mechanics. Unlike some of the reflex-based shooters that you might regularly play, the aiming reticle in this game will shrink the longer you focus on a target that you want to shoot at. A smaller aiming reticle naturally means higher accuracy as compared to a wider reticle. Not to mention, you’ll need to learn to reload your weapon rapidly by looking downwards, and at the most opportune times, so you can maximize the use of your time since each match, whether if it’s a practice match or a competition, will have a time limit for you to complete the shooting course. If you performed well in a shooting course, you’ll then be awarded with a bonus round whereby you can earn 200% more gold bars. The bonus shooting courses are different from the ones you usually play. For example, there’s a bonus round where you’ll have to shoot at a slot machine to ring in the slots. There is also another bonus course in which you’re required to shoot at shells to open them. If you managed to win gold bars, you’ll even need to shoot at them in order to collect them. Of course, like any shooter game, you’ll be able to view your stats, such as your win/lose ratio, accuracy, guns owned, and gun specialty via your profile. If you’re good in this game, you might even make it to the leaderboards or be appointed as “the Star of the Week”. In short, Shooting Showdown 2 is an incredibly fun and addictive casual yet competitive shooting game that becomes even more interesting once it is ported over to the virtual reality platform. If you love shooting at targets, this is definitely a game that you should get for your Oculus Home library!